The University of Leicester is involved in new research conducted by archaeologists from the University of York and the Universitat Autònoma de Barcelona, in collaboration with members of Tel Aviv University, that reveals striking insights into the living conditions and dietary choices of those who lived during the Middle Pleistocene some 300,000 – 400,000 years ago. Anita Radini from ULAS was among the team involved in the study, which has been published in Quaternary International and examined samples of plaque which were extracted from the teeth of three Lower Palaeolithic hominins who lived in Qesem Cave, Israel. Microfossils extracted from dental calculus. 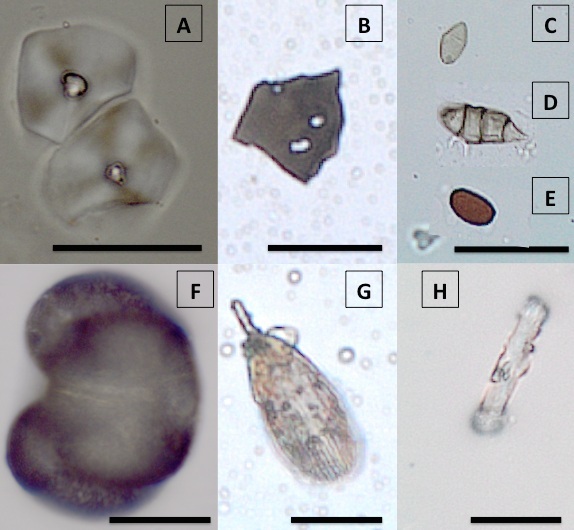 A=starch granules; B=microcharcoal; C=fungi, type 1 spore; D=fungi, type 3 spore; E=fungi, type 2 spore; F=pine pollen grain; G=Lepidoptera (moth and butterfly) wing scale; H=long smooth long cell phytolith. Conducting optical and chemical analyses on the plaque, which acts as a store for inhaled and ingested materials, researchers found starch granules and specific chemical compounds. This comprises the earliest direct evidence for selection and consumption of nutritional plant foods, most probably in the form of nuts or seeds. Offering a stark contrast to the notion that an early Palaeolithic diet was based largely on meat, these results imply that ancient Palaeolithic hominins were able to sustain a diet that was not only about survival, but also enabled them to thrive and adapt. Making deliberate use of local, nutritional plant resources ensured that their diet fulfilled their physiological requirements and suggests a detailed knowledge of the local ecology. Qesem Cave, in Israel, contains the world’s earliest secure evidence for deliberate human use of fire. Finding evidence of smoke inhalation in the dental plaque, researchers detected an early need for methods of smoke management. The study also identifies the first evidence of potential respiratory irritants and allergens, including fungal spores and pollen, while plant fibres and microwear patterns on the teeth point to chewing of raw materials and possibly oral hygiene activities such as tooth picking. Dr Karen Hardy and her team published research on the dental calculus of Neanderthals from the El Sidrón cave in Spain in 2012, but these dated back only 49,000 years. This study is several hundreds of thousands of years earlier. The Spanish Ministry of Science and Innovation and Pharos Research funded the dental calculus project. The Qesem Cave excavations are supported by the Israel Science Foundation, CARE Archaeological Foundation, Leakey Foundation, Wenner-Gren Foundation, Thyssen Foundation and the Dan David Foundation. – The research was led by Dr. Karen Hardy of the Catalan Institution of Research and Advanced Studies (ICREA) at the Universitat Autònoma, Barcelona, together with Dr. Stephen Buckley of the University of York, Anita Radini of the University of York and the University of Leicester, Prof. Ran Barkai and Prof. Avi Gopher of TAU’s Department of Archaeology and Ancient Near Eastern Civilizations, Dr Rachel Sarig of TAU’s School of Dental Medicine, and Prof. Les Copeland of the University of Sydney, Australia.